On Thursday 15th May, 2014 my father, for whom I am named, finally marched off parade and into the memories of those who knew him. He was in his 90th year. He was a veteran of World War Two, a conflict that shaped him and affected every day of his life from when he was sixteen and joined up (after lying about his age) until the day he died. 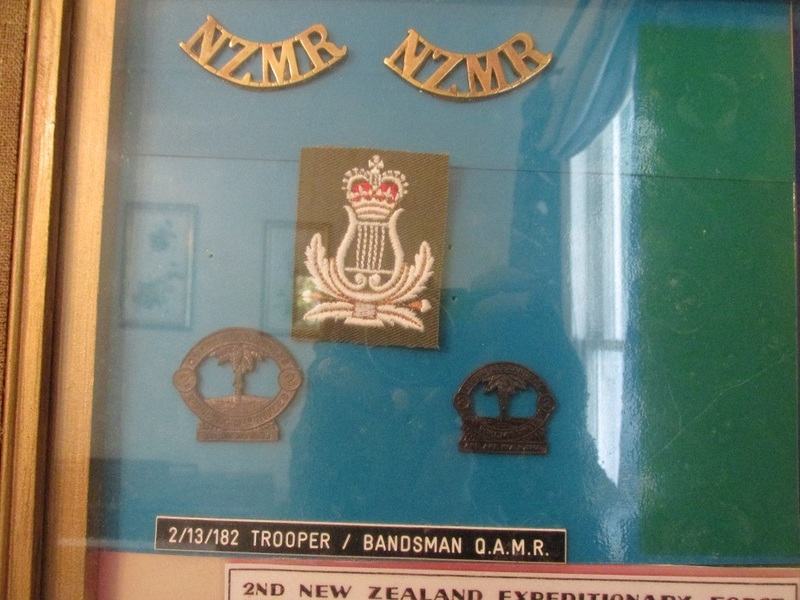 He started his military life in 1940 as a Trooper/Bandsman in the Queen Alexandra’s Own Wellington West Coast Mounted Rifles. They actually rode horses and practiced cavalry charges with lance and sabre. 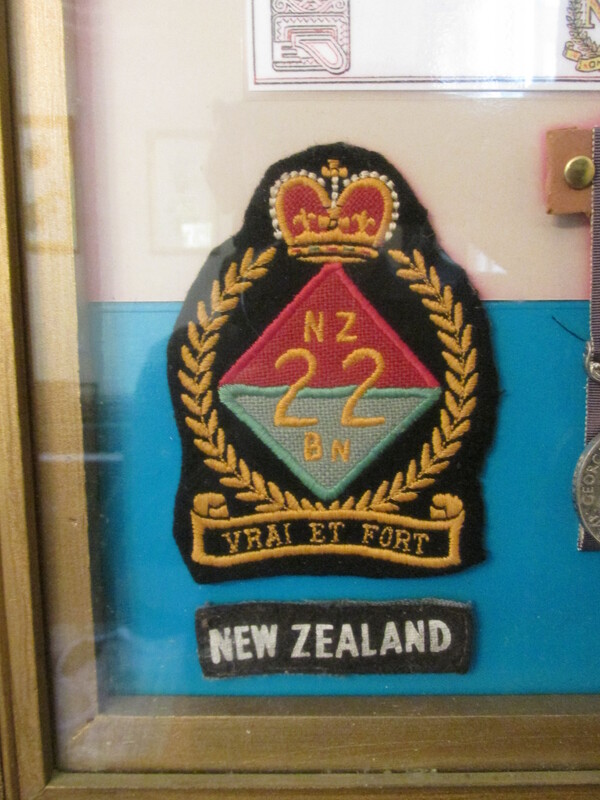 He transferred to the Coastal Artillery and was stationed at the forts covering Wellington Harbour. He operated the mechanical range finding calculator to feed targeting information to the big guns. The Range Finger shoulder flashes below are rare as hen’s teeth. I have been looking for another set for years with no success. Rather glad that Dad managed to keep these items. 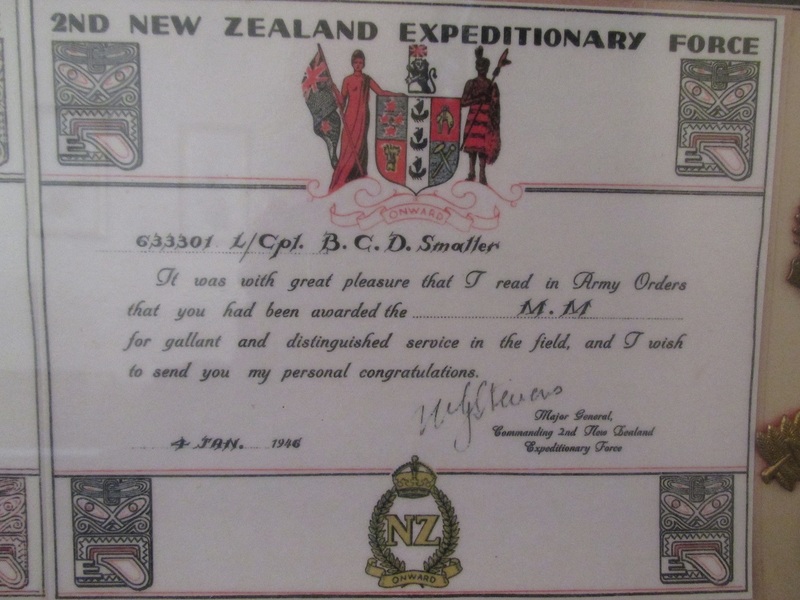 In 1942 he transferred to the Infantry and first went to Egypt for training and was posted to 22 Battalion, 2NZEF as a replacement. His first taste of action was in Italy in 1943 at Monte Cassino, a hell of a baptism of fire. He spoke of the horror of experiencing combat in such a nightmare place, and how he quickly learned to respect the enemy he was fighting. My father was a natural soldier. He fought throughout the rest of the Italian Campaign. Like most New Zealanders of the time he was used to living rough and was able to make-do with what he had on hand. For the most part he enjoyed soldiering. 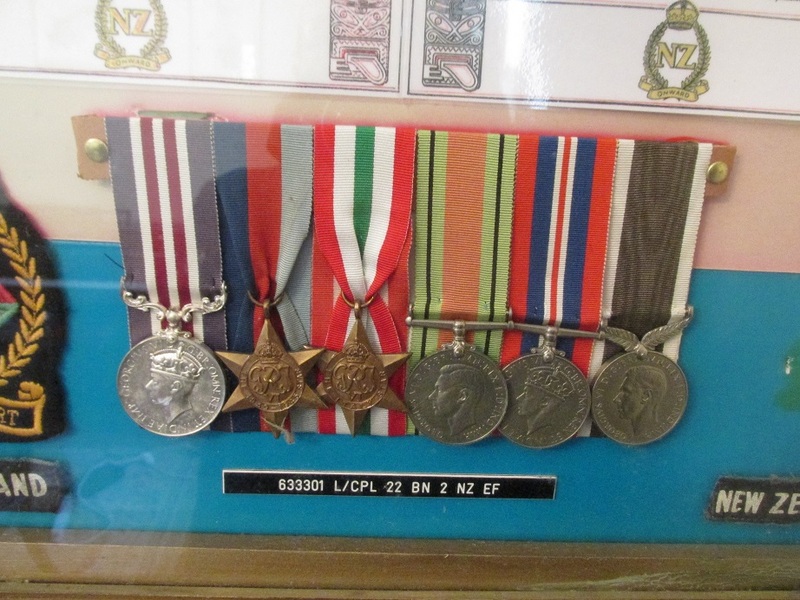 He was awarded the Military Medal for bravery. 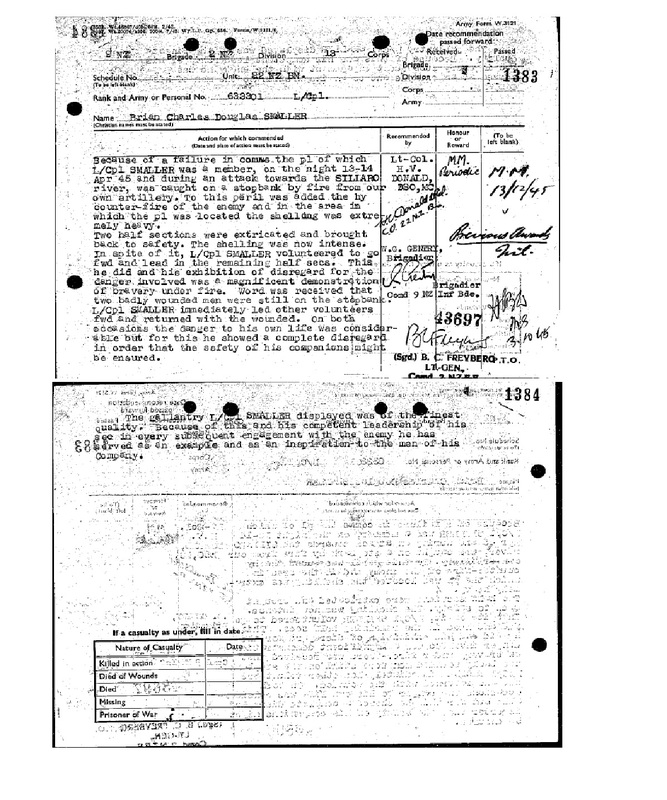 This is a copy of the original citation document held in the War Office Archives in the UK. The original presentation certificate signed by the King was lost to a fire. He said that he must have been shell shocked because no sane person would ever have done what he did. Self-deprecation is the way of Gallantry Award winners it seems. He always said that he didn’t deserve his medal and better men did. In latter years he spoke of this award with a mixture of pride and embarrassment. 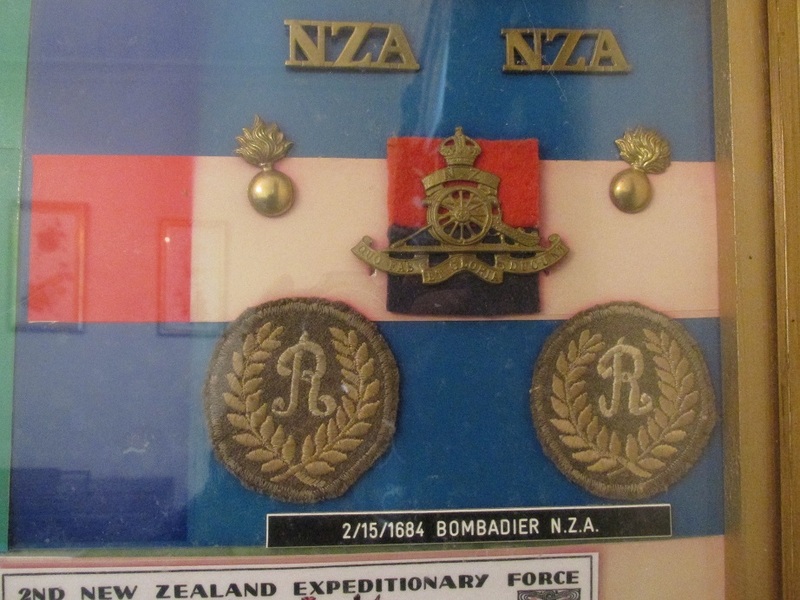 He never actually received his medal until about 1950 when his old Divisional Commander General Freyberg, who was Governor General of New Zealand at the time, came up from Wellington to Wanganui (the town where Dad and his young family lived) and presented him with it at a special ceremony at the Opera House. Dad had to draw a uniform and present himself. He had been demobbed in 1947. 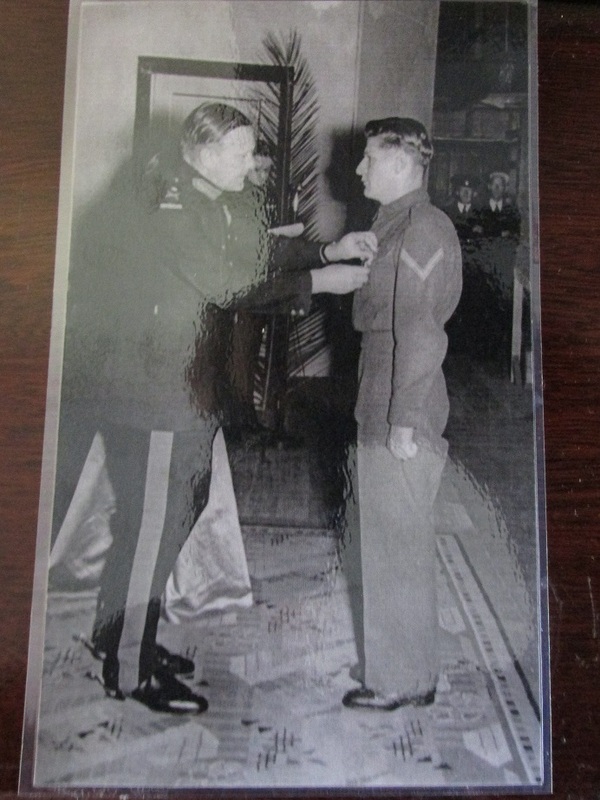 Dad did have the opportunity to go to London in 1945 to get his medal pinned on him by the King but he was chasing a young Italian woman (my mother) at the time and that seemed more important. He told me that having “Tiny” Freyberg pin his medal on meant more to him than if he had got it from the King. After all, Tiny knew him by name. A full shot of what Dad called his Brag Board. You will notice that bottom right there is a badge missing. That was a cap badge of his with a dent in it where a bullet nearly took his head off one day. When Dad gave me this Brag Board before he went to live with my sister in Australia he took it with him. His good luck charm he reckoned. You never remember your parents as anything other than old, and sometimes it is hard to imagine they were anything else. I see that in my own kid’s eyes. But he was a young man once. Dad in centre with Bren. A moving tribute, Brian. You have every reason to be proud of your father!I hope that the rest of his life was at least as worthy! posted late last year about our trip to Arlington National Cemetary to inter my dad there. He died a few weeks short of 90, and was also a WW2 veteran, having landed at Normandy on D-Day. There are fewer and fewer left with each passing year. Thanks Peter. In a few years we will be reading about ‘the last WWII vet’ dying. History marches on. They were tough old bastards our Old Men, weren’t they just. Thanks Brian, very inspirational. We all owe so much to heroes like your father, may he rest in peace. Thank you for a very moving post about your Dad. My Dad served in the Navy during WWII and my Uncle (who was just too young to see combat) served with REME in Korea. I remember reading in the press before the Falklands articles suggesting that “the kids of today” just weren’t up to fighting wars the way previous generations were. But they always seem to step up to the plate, just as they have in the past. Thanks for sharing your Dad’s story with us. He was obviously quite a chap. A moving tribute, my condolences to you and your family. Thanks guys. He was a complicated man. Took me a long time to realise that the war affected him so much. I would hazard a guess that today he would have been diagnosed as suffering PTSD. Brian, I see that haddon Donald was you dad’s c.o.. I interviewed him several years ago and I know he was very proud of the men in his battalion in Italy. For him to recommend your dad for the mm must have meant that he truly deserved it. Something to be very proud off that he risked his life to save his battalion mates. I have met and talked with Haddon Donald a few times over the years. I got to meet a lot of the old 22 batn men at their last big reunion at Trentham in 1990. He signed a copy of his book for Dad just after it was published. And the world has lost another enterprising man. A real warrior knows what matters, and what really matters is rarely to be found with a king or a medal. Well I would not be here if he had gone to London! I have scoured my own Family log for such war-time heroes and have found an RAF mechanic and a Navy Serviceman, on my mothers side… My fathers family were all ‘reserved services’ – farm hands or miners… still needed in their way to keep the country running I guess… Perhaps that’s why I am here at all today? A moving tribute Brian, and one I enjoyed reading. Thanks Scott. Appreciate the comment. Brian, this is a beautiful post. I am so sorry for your loss, it sounds like your father was a remarkable man. My grandfather was part of the Canadian troops in Italy. He had nothing but praise for the Canadians. Fought with them. They liberated my mother’s hometown of Campobasso. What a wonderful tribute to your dad. We’re so sorry for your loss. Sorry for your trouble. Rest well, Corporal Smaller. 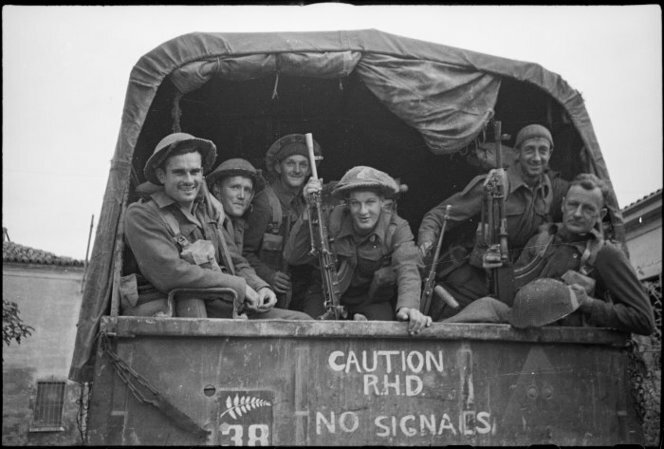 “A magnificent demonstration of bravery under fire” — those are words to treasure, but even more, I think, is the thought of the blokes your Dad helped to get out who might not otherwise have lived through it. Thanks John – I have incorporated that thought into a few words I wrote for his service. Beautifully put together Brian. Again, my condolences to you and your family. 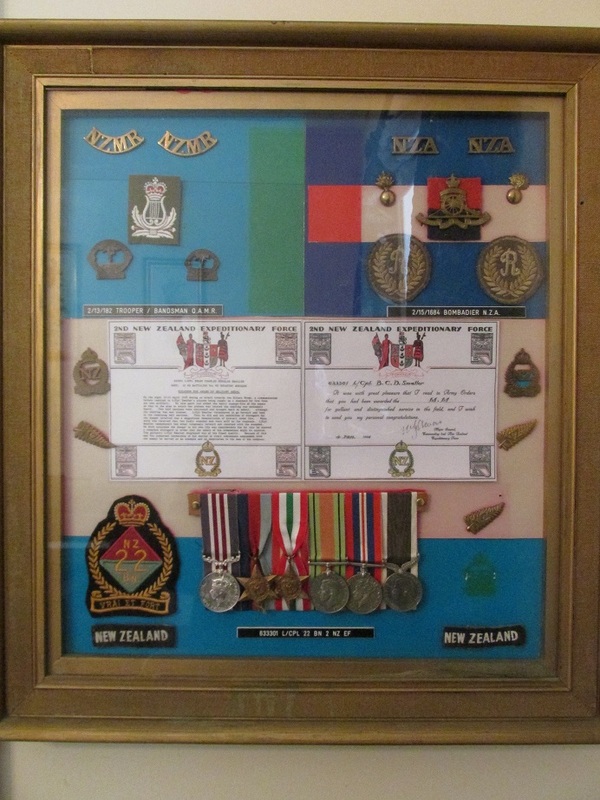 Privileged to read of your Father Brian, and very cool to read his medal citation – the signatures on it! Thanks Sharn. He had five kids, 13 grandchildren, about ten great grandchildren and at least two great great grandkids I know of:) Quite a legacy. What an amazing and touching tribute to your dad. Where would we be without the brave ones like your dad who serve in the military. My hubby is a WWII veteran. So sorry for your loss. Thank you for sharing your dad with us it was very interesting to read about him. You will miss him but he has left wonderful memories for you to think on. Prayers and hugs! Thanks you for your kind words – all the best to you and your husband. Lovely tribute Brian, sorry for your loss, thanks for all the information. It was very moving to read your post Brian. He was all of the things mentioned here and he was our Dad. He loved us and was proud of us and we were of him. I will be thinking of you tomorrow. Thanks Big Brother. Love you.